A couple months ago, Eminem surprise released his tenth studio album, Kamikaze, overnight between Thursday, August 30th into the early morning hours of Friday, August 31st with no prior announcement whatsoever. Kamikaze first caught my attention because of its front and back album artwork, an obvious homage to the Beastie Boys' genre-shaping 1986 debut, License to Ill, complete with cleverly scrawled "TIKCU5" and "FU-2" fighter jet tags. An obvious rebuttal to Eminem's widely-loathed and seemingly half-a$$ed 2017 album, Revival, Kamikaze, however, made headlines for homophobic slurs on Justin Vernon-assisted "Fall" allegedly, aimed towards controversial rapper/producer Tyler, The Creator. While, yes, this is unfortunate Em is still using such homophobic slurs in 2018, honestly, is anyone really all that surprised? Not that it makes it right, but Eminem has, unfortunately, been using racial, homophobic, misogynistic, and hateful speech since "My Name Is" from his commercial break-through, The Slim Shady LP (1999.) 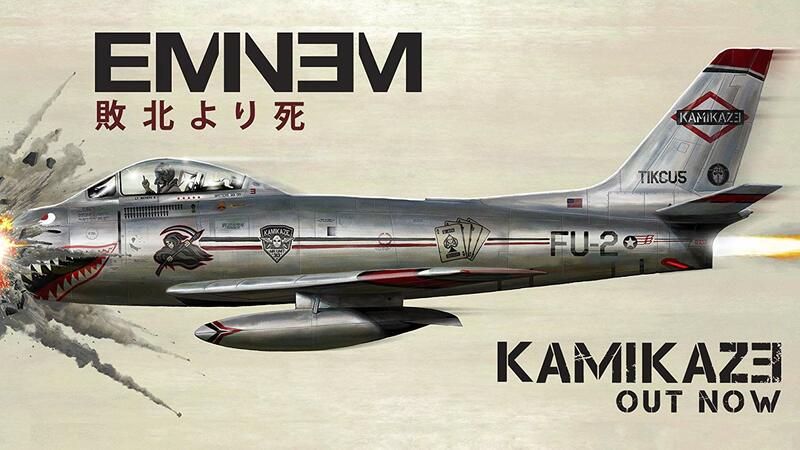 Despite all this controversy, I personally, enjoyed Kamikaze as much as one could/should; while this isn't Eminem's best album, it's also, far from his worst, especially, for an emcee nearly 30 years into his storied career. While we, here at The Witzard, DO NOT promote or endorse such hateful language... at this point, we really shouldn't be surprised by Marshall Mathers and his repeated attempts at garnering the spotlight however he can; even though, he's undoubtedly, one of the most skilled lyricists Hip-Hop, and music as a whole, has ever seen! Aside from the aforementioned tracks, Kamikaze also, includes Machine Gun Kelly (MGK) feud re-igniting track, "Not Alike," to which MGK responded with lackluster "Rap Devil." Eminem, soon responded with Ether'ing diss track, "Killshot," to which Machine Gun Kelly responded with a... Tweet, which read: "2 weeks and 3 interviews later..." as well as a couple Emojis, silly hashtags, and a Dancing with The Stars meme. Yes, this is the state of Hip-Hop in 2018! DISCLAIMER: I'm a life-long Spider-Man super-fan, so, in my humble opinion, one of Kamikaze's saving graces was album closer "Venom (Music from The Motion Picture.)" Somehow, for whatever reasons, this is a Spider-Man-less Live Action/Super-hero film starring Hollywood hunk and former rapper Tom Hardy as Spidey's greatest adversary, Eddie Brock/Venom. Just this past Thursday night, on the eve of Venom's world-wide release, Eminem unleashed a sinister music video for "Venom (Music from The Motion Picture)" wherein a Revival CD births a Symbiote, which wreaks havoc upon the dimly-lit New York City streets. 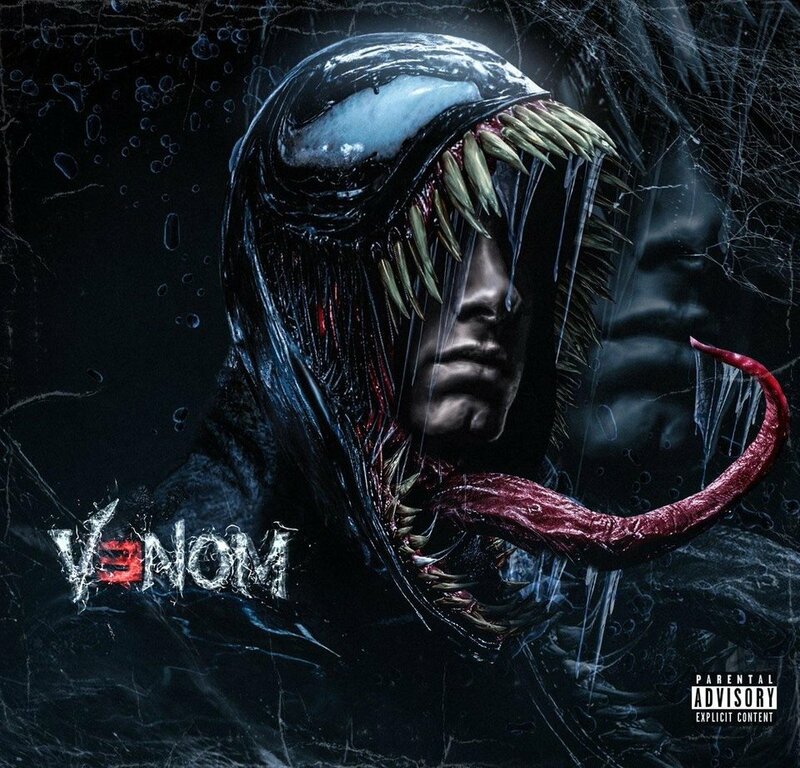 Sample lyrics: "Ain't no telling when this choke-hold / On this game will end, I'm loco / Became a Symbiote, so / My fangs are in your throat, ho / You're snake-bitten with my—venom!" Also, featured within the film (which I have yet to see!) are Venom-themed tracks from PUSHA-T and supposedly, Run The Jewels, as well as a score composed by frequent Childish Gambino collaborator Ludwig Göransson.